We travelled from Stokes Bay via the North Coast Road (dirt). We were going to call in at Western River Cove but the road was very steep and windy and not suitable for caravans, so we gave it a miss. 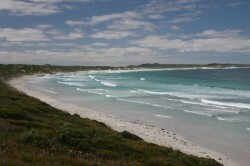 Instead we headed to Western KI Caravan Park and booked in for a week. We felt a need for power, water and some easy days. We feel very relaxed and it is a bit of a struggle to fit in a shower and breakfast before lunch, which tends to get pushed out to 2 or 3. Western KI has a rather unusual public phone box. 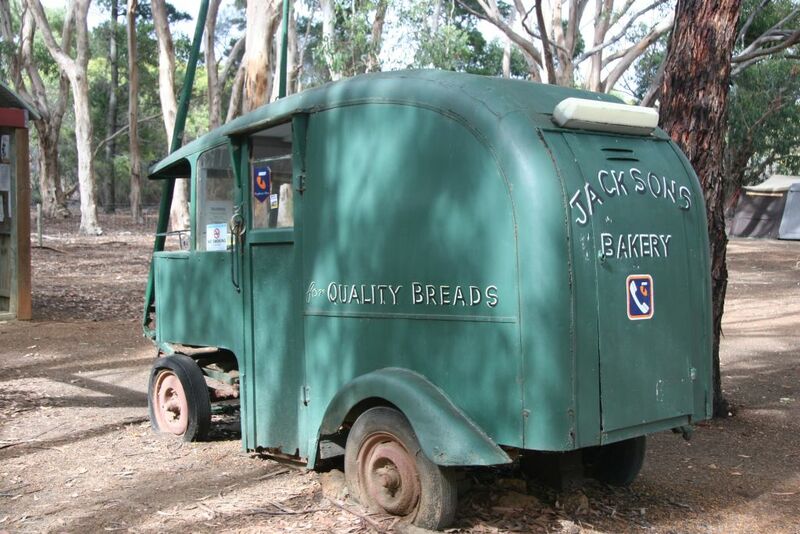 It started life as a motorised van, and, after the motor died, it became a horse drawn van, both on the mainland. 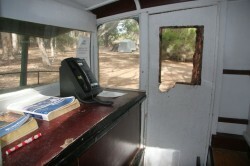 It was then brought across to Kangaroo Island and finished up at Western KI as a phone box. You can see the two shafts for the horse sticking up above the front of the van. 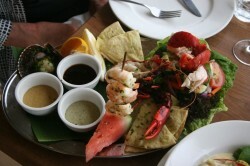 On Sunday we went to the Marron Cafe and had a wonderful meal, expensive but worth it. Marg had the Marron Platter, which had a scallop, prawns, hot Marron and 3 small cold Marron served with Garlic Pita bread, a delicious salad, chips, and three dipping sauces. 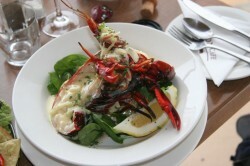 The sauces were Lemon Mytle and Caper Tartare Sauce, Honey Sweet Chilli and Soy Sauce, and a home made seafood dressing. I had two tails of grilled marron (about 350 gm) with a Verjuice and Sav Blanc cream sauce with a Spinach, capsicum and Potato stack. It was all so good. When it was served, we thought we would need a doggy bag, but, all too quickly, the platters were empty (I did help Marg a bit though, it was the gentlemanly thing to do!!). On the way back home, we called in at Vivionne Bay to check out the camping area, which was OK but not brilliant and well back from the spectacular beach. We may stay there a couple of nights after we leave here. Yesterday we stayed in for the day and Marg cooked a Pork Loin on the Cobb, with perfectly cooked roast spuds, parsnip, home grown carrots and onion. The coals were still hot when lunch was over, so Marg made some rolls, some of which we had today for lunch. Excellent and much better than the stale ones we have been freshening up for lunch previously. Today we headed for 75,000 Ha Flinders Chase National Park. 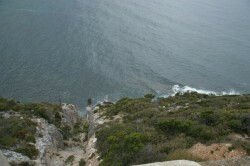 The Park had been extensively burnt in 2007, and while the regrowth is well established, the views are spoiled somewhat by the grey haze of the tops of burnt Mallees. 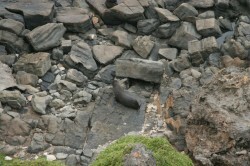 First stop was to Cape du Croeudic to the south where there are hundreds of NZ Fur Seals and a lighthouse. Also walked down an excellent boardwalk and stairs, to view Admirals Arch, which is a tunnel eroded though the cliffs by the sea. 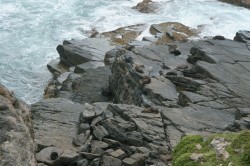 The seals weren’t doing much, just sleeping. We then went to the east side of Cape du Couedic to the site of the old storehouse that was used to house the supplies for the lighthouse staff in the years 1907 to 1936. 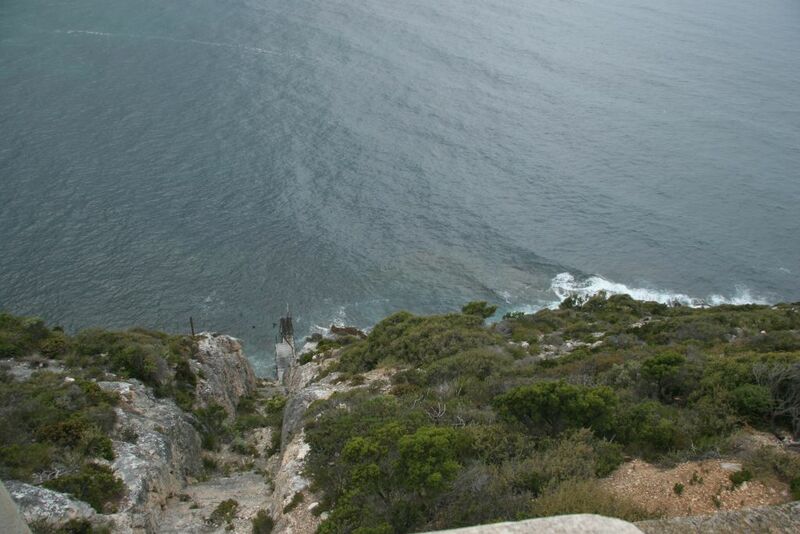 It is now a ruin but you can see the haul-way cut into the 150 foot cliff and the jetty in the photo below. Supplies were delivered every three month, and the stone storehouse kept them cool. The winch raising the supplies was driven by a stationary engine. From here it was off to Snake lagoon for lunch, not surprisingly we nearly ran over a 1.5 m black snake on the way back after lunch. We were thinking of camping here, but the camping area was not very good with lots of small regrowth that blocked out the rest of the bush beyond the camping area. 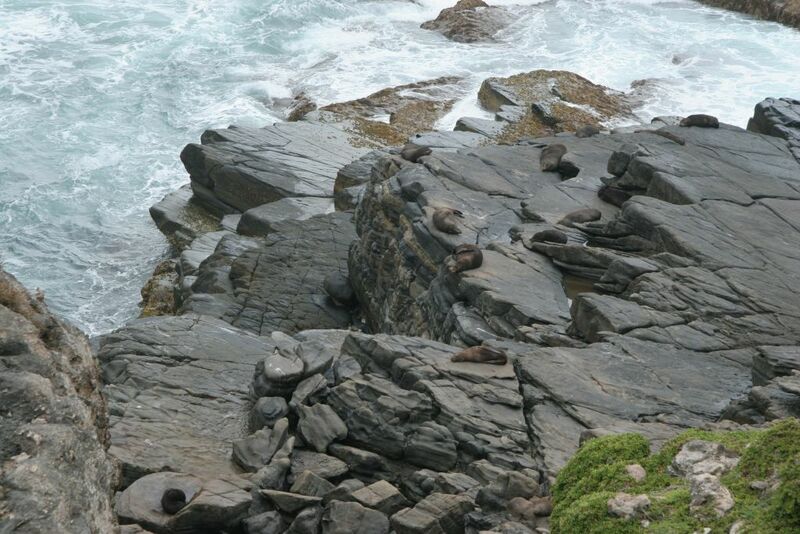 There was a walk to the coast from the campground, but Marg’s legs were too sore to tackle the walk, after walking down the boardwalk and stairs to view the seals at Cape du Couedic. We went back to the visitor centre for a refreshing glass of wine and checked out the Rocky River campground. The three caravan sites are just gravel between two rows of small bushes, all in a line, not good. Some of the camping sites there are OK but we can’t use them. 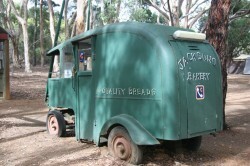 The adjacent picnic area is excellent with large trees and plenty of covered picnic tables and gas BBQs. We went for a short walk near the visitors centre through some fairly clear bush with lots of big trees. 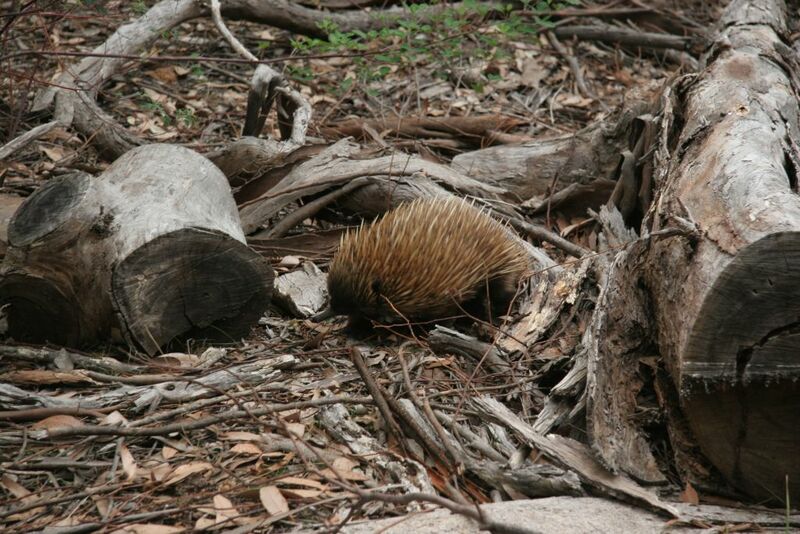 On this walk we spotted an echidna, see photo below. 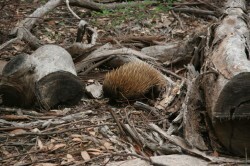 On Kangaroo island the echidnas are a lovely honey yellow colour, we saw two others walking on the side of the road to Cape Couedic.